If you are planning to promote your business with a bang in New Year, then you cannot ignore calendar magnets. It’s high time to pursue your 2013 calendar magnets with logo and business information. Over the years these magnets have become one of the most favored promotional tools. If you look closer, then it can be seen that following pointers have favored in its elevation from a mere refrigerator art to a value added promotional tool. Subliminal and Subtle Existence – Over the years we have remembered the commercials (read brand names) for various factors. Most of them have seeped into our consciousness due to the uniqueness of presentation. Some well-known brand names tried to push these commercials by making them loud and gaudy, whereas some others choose to stick to the subtle theme attract our attention. We do remember both kinds of commercials, but we will favor the ones, which draw us with their subtlety. Calendar magnets can exactly do the same, and still remain powerful.People in your office or at home may not stop every time to read the business contents imprinted on these magnetic calendars, but they will definitely remember the brand symbols. The continuous visual interaction results in an unconscious addiction, which works in favor of a brand. A person will definitely remember your brand information, the very moment they feel that you can serve them better. Inexpensive and Valuable?! – We all are grown up to believe that all expensive things are good. This is true to some extent and may fail at other times. The magnetic calendars seem to be an aversion and they truly personify the saying “Expensive things which are considered among the best things, can come in small packages.” We often see advertisers spending hundreds of dollars every month on print and media campaigns. The best thing is that you can still purchase them by spending something as low as 30 cents per piece. This means good things come in small (price) packages. Creative Advantage – Advertisers can think in creative ways to push down their products through customers minds. The same can be rubbed during creation of magnetic calendars too. 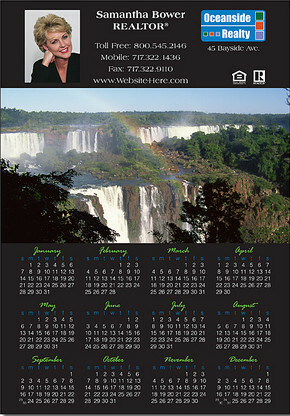 You can choose to create your 2013 calendar magnets in best possible form that closely matches your business requirements. Suppose you are practicing dentist then its best to zero on teeth shaped magnets or if you are wishing to promote an elementary school then its best to hunt for different types of school calendar magnets. After reading through this blog, and visiting some well-known online magnet stores, you can best understand how easier it is to function with these magnets than bigger hoardings, pamphlets, or television commercials.